When the Sun Sets and the Curtain Rises. Grand Canyon, AZ – The Grand Canyon Dinner Theatreentertained a packed house on Monday, June 11th, for their grand opening. This world class dinner theatre is located in the South Rim gateway community of Tusayan, about a mile from the National Park entrance. Grand Canyon business owner Elling Halvorson and his family have worked hard over the past year to create a unique tourism experience at the gateway to the South Rim. Elling says “There is a new magical moment for every Grand Canyon visitor – when the curtain rises, our audience enjoys a pre-show video, with scenes of the beautiful Wild West shown on our amazing 200-square-foot stage video wall. Soon afterward, the stage fills with lively song and performance by five very talented actors, with our exceptional video wall serving almost like a sixth actor. We wanted to create a world-class entertainment experience that compliments the Grand Canyon experience, and I believe that is what our team has achieved.” Grand Canyon visitors are now able to enjoy the stage production and after–party festivities seven nights a week. 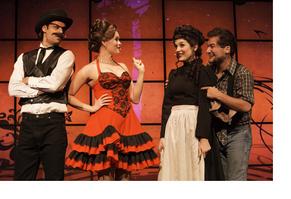 The featured 55-minute musical production, “Miss Kitty’s Grand Adventure”, is set in the early 1900’s on a Grand Canyon Train platform. Miss Kitty, a young girl from Philadelphia, has come to the Wild West to work as a Harvey Girl waitress, and is accompanied by various other vivacious, song-filled cast members throughout her adventure. The show is an original screenplay written by award winning playwright Douglass Hallenbeck who was joined by choreographer Laura Nickerson and music arranger Edward Harris Roth. The bountiful dinner in the theatre is served family-style, with platters of entrées and heaping bowls of tasty side dishes delivered to every table. Stick around after the Sundown Show for Grand Canyon After Dark, the Canyon’s only after hours party. Music, karaoke, drink specials, and late-night appetizers will keep the party going all evening long. Meet the cast, get autographs, and take souvenir photos. Didn’t attend the show? No problem – everyone is welcome in the theatre room. Shows are performed nightly, Monday through Sunday, 365 days a year. Reservations can be made by calling(928) 638-0333 or by visiting www.grandcanyondinnertheatre.com. Follow the Theatre on Facebook atwww.facebook.com/grandcanyondinnertheatre for the latest specials and promotions.